DALLAS—Not long ago, at a little horror convention in New Jersey, I hosted interviews with some of the most famous stunners in B-movie history—all of the beauties from the Hammer films of the ’50s, ’60s, and ’70s—but the woman everyone wanted to see that day was a veteran character actor named Julie Adams, well preserved into her 80s and still inspiring shock and awe in the teenage faithful. We chatted about our respective Arkansas high school days—she was Miss Little Rock 1946—and her work with Jimmy Stewart and other famous actors, but when the panel started, everyone wanted to know about the one movie that would follow her through her whole life: Creature From the Black Lagoon. It was a movie easy to dismiss in 1954, a low-budget King Kong lite about a misunderstood creature and a beautiful girl who have a psychic connection verging on love. But since it was only 79 minutes long, the perfect length for TV syndication, it became a staple of afternoon “creature features” for several generations, and it was just all-American enough to escape the attention of concerned moms who probably couldn’t figure out why their sons were so obsessed with it. What was the main attraction? Was it the Gill Man, the king of all rubber-suit monsters, who survives from the Devonian period in an Amazon lagoon and preys on a ship full of scientific investigators? Or was it Julie Adams, the only female in the movie, whose curvy leggy body and perky breasts are poured into a white French-cut crotch-enhancing swimsuit as she plunges into the lagoon, Esther Williams-style, and performs her seductive underwater dance? It was both, of course. The one sequence that sticks in the mind long after the details of the movie are forgotten shows the gill-faced creature swimming below the backstroking fantasy woman, studying her, following her, yet never approaching as she performs her underwater spins and turns. The monster may or may not be falling in love—the movie is short on exposition in this department—but the 14-year-old boys in the audience definitely are. It doesn’t take a master psychologist to see how a pubescent boy, struggling with feelings of being ugly, unloved, and half-formed, would not only identify with the creature (who has acne-like protuberances on his face) but imagine a girl just like Julie Adams who would finally come to rescue him from the lonely black lagoon called his room. This masterfully directed underwater sequence would later be copied by Steven Spielberg, almost shot for shot, in the opening sequence of Jaws—but in that case the creature obviously has lunch, not love, on his mind. The beautiful thing about the original is that we somehow sense, in spite of the ominous music, that the girl is safe and in fact belongs here instead of in the arms of the man she thinks she loves, the handsome but boring Richard Carlson. 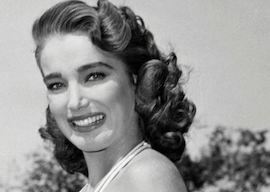 Julie Adams, who died last week at the age of 94, was not particularly happy about being cast in the film. She was 28 years old at the time and getting desperate to escape the low-budget world. Born in Waterloo, Iowa, raised in Little Rock, she moved to California to become a movie star, and got her break in 1949 with a tiny walk-on in Red Hot and Blue that showed casting directors how absolutely stunning she was. Being known for being absolutely stunning can have its downside, though, as she was quickly consigned to a series of quickie B Westerns. Her claim to fame was having the best legs in Hollywood, but because she’d appeared exclusively in Westerns, they were not seen on screen for five years. The daring white swimsuit would change all that. Creature would turn out to be the most memorable role of her career. After Slaughter on Fifth Avenue in 1957, she semi-retired to raise two sons, although she never stopped acting and had a recurring role on Murder, She Wrote (as Eve Simpson) for five seasons in the ’90s. As though to reinforce this rather doubtful scientific conclusion, the next scene shows a hapless extra, left to guard the archaeology camp, getting beaten to death by the creature, which is still revealed only by some close-up shots of its hand and arm. By making the creature’s first act a senseless killing, the movie loses the moral ambiguity of King Kong, in which the creature becomes violent only when provoked by man. When the expedition arrives in the Amazon, a ponderous native captain makes a speech about this jungle where everything has been unchanged since time began, and where centipedes are a foot long, rats are as big as sheep, and nine-foot-long catfish dine on humans. “Like everything in this jungle,” says the captain. “All killers.” Shortly thereafter Julie Adams bounces around the camp in lust-inspiring short shorts long enough for the now-clichéd claw to come within inches of her leg. It’s only a matter of time, the movie seems to be telling us, until the creature will kill again. Underwater photography is usually the most boring, slow-moving part of any movie, but Jack Arnold’s direction of the diving sequences as these two men venture down to search the lagoon are always crisp, fast-moving, and easy to follow. As soon as the creature appears, of course, Denning wants to kill it and take it home as a trophy, while Carlson wants to preserve it for science. After the Gill Man is wounded by Denning’s speargun, the creature has no alternative but to systematically eliminate the supporting players and protect his turf. But the creature’s violence actually begins earlier, after a spent cigarette is absentmindedly tossed onto the surface of the pristine lagoon. This one image has led to a lot of claims that the movie is actually an ecology tract, in which the monster is nature itself revolting against the depredations of man. But ecology, everyone agrees, was not on Jack Arnold’s mind in 1954, and if anything it was just another way to ruffle the lagoon water and create suspense. It’s easier just to assume that painfully wounding a Gill Man with a speargun will make the Gill Man turn nasty. And he does, taking his revenge on crew members and eventually—after he’s shot, drugged, beaten, netted, caged, and set on fire—building a crude dam at the entrance to the lagoon so the interlopers can’t escape. But does he do it out of love or anger? When he finally gets his hands on Julie Adams—we knew it was inevitable—he takes her to his secret grotto and lays her body on some kind of rock altar. Carlson arrives in time to save her—Denning has, of course, gone on to his just rewards—but is armed with only a knife, and it’s left for two supporting players who appear out of nowhere to pelt the creature with gunfire until he staggers into the water and swims away. What’s odd about the last scene is that there’s no moment in which we see what the monster’s intentions are. He doesn’t brush her hair away from her face or do anything except steal her, carry her, and dump her on a rock. (During filming Chapman actually bashed Adams’ head so hard that she missed several days with a concussion.) In other words, we don’t know any more about him than we did when he killed the guy in the camp in his first big scene. Then again, maybe a 14-year-old boy who suddenly had Julie Adams in his arms wouldn’t have known what to do either. Though they couldn’t have known it at the time, Creature From the Black Lagoon would be the best-remembered film of almost everyone who worked on it. The movie would go in and out of fashion over the years, with critics uncertain whether to call it a camp classic or a genuine work of imaginative science fiction. It was licensed as one of the most popular pinball machines ever sold. Its poster—“Not since the beginning of time has the world beheld terror like this!”—became a prized collector’s item. There were two sequels, neither as popular as the original. And Julie Adams’ swimsuit and short-shorts continued to be the means by which millions of boys were initiated into sexuality. She was the essence of beauty, she was virginal, and, most important, she was attainable. But even that was not entirely what it seemed. The famous underwater sequence features brief footage of Julie Adams doing the backstroke, but as soon as the point of view switches to the creature, all the swimming is performed by stunt double Ginger Stanley. No wonder the monster was confused. No wonder Julie never understood her power over men.